Learning how to make your own boot cuffs from a sweater and how to make your own leg warmers from a sweater is so easy! Read on to learn how to make your own. Happy New Year! I hope everyone had a wonderful and safe holiday filled with friends and family and all that good stuff. Now it’s time for New Year’s Resolutions, which, if yours include saving money, being environmentally friendly, and/or staying stylish, this easy DIY project is right up your alley! If you’ve seen any of the past how to projects I’ve done for both Petit Elefant blog and my own, you may have figured out that I like to make things out of everyday materials you probably already have around the house. 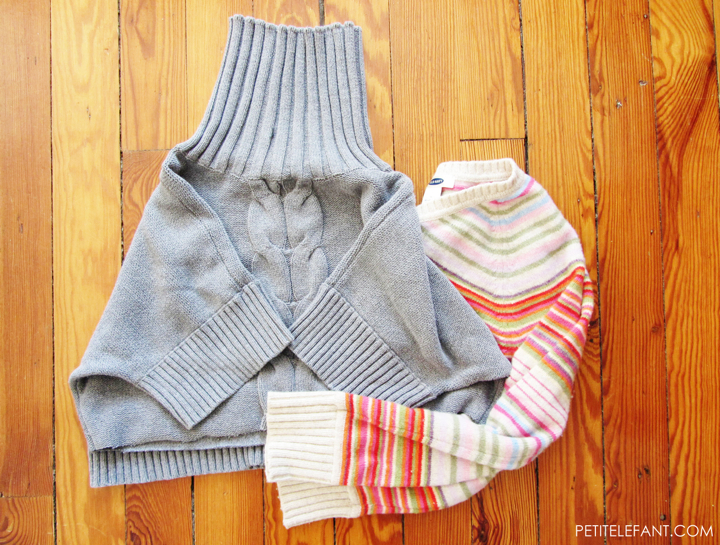 One material I’m particularly fond of is old sweaters. Knitted objects are so “in” right now and using sweaters lets you have the finished knitted product without ever having to pick up a set of needles! 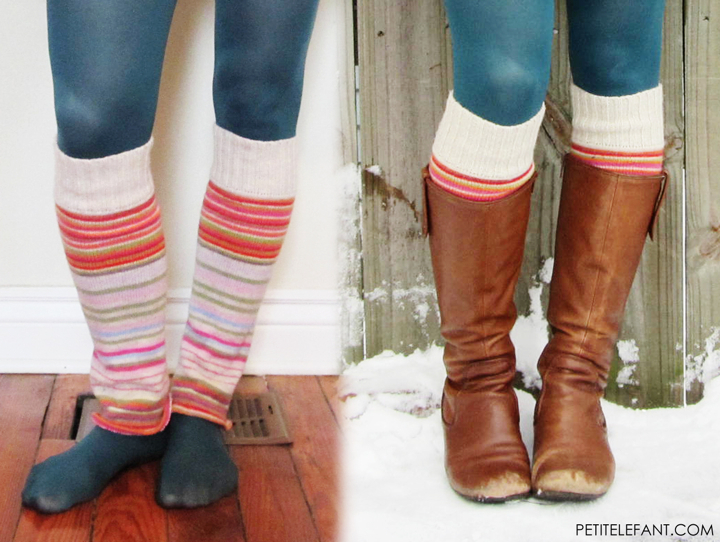 I love wearing boots and tights in the winter, and I love the trend of wearing tall, thick socks under them. However, really thick socks aren’t always comfortable to wear with my boots. So why not have the look of those bulky socks without having to really wear them? Remember Dickies — those shirts that look like you’re wearing a turtleneck or a collared shirt but have no sleeves? (Are those even still around?) Anyway, this is the same idea but for your boots. I’ve accumulated a quite a collection of sweater pieces over the past few months from various sweater crafts, so I was able to use some of those leftover sleeves and bands. If you don’t happen to have leftover sweater sleeves lying around, just use an old sweater from your closet or thrift store that’s ready for a new life. 2. Cut open the ribbing along a side seam so you have one long flat piece of ribbing. Cut two equal pieces. I cut each piece about 12” long. 3. Sew as close to the cut edge of the ribbing as possible to avoid unraveling. (This will be the bottom of your cuff, so you won’t see this side anyway) Then wrap the piece around your leg where you’ll be wearing it to mark where to sew it together (right sides together!). 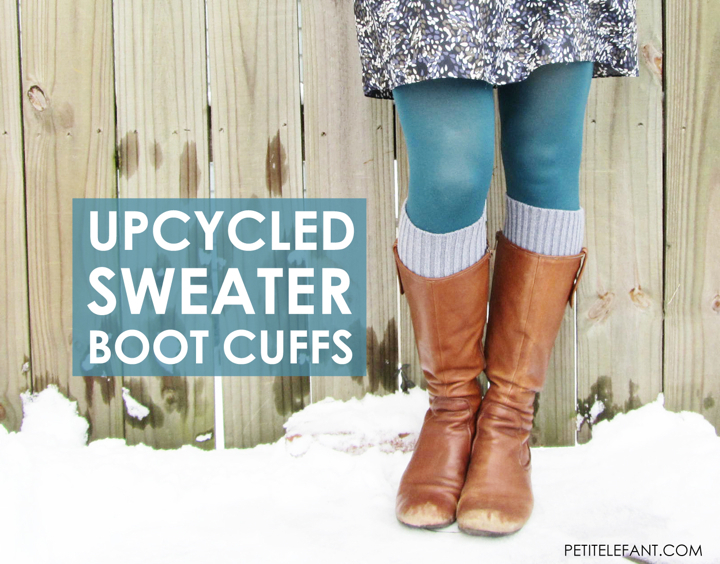 Flip right side out and you have your boot cuffs! 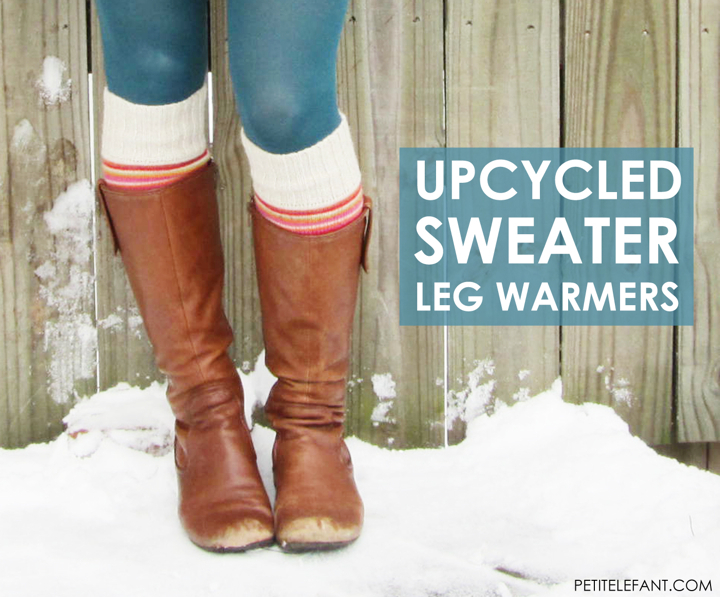 You can also make an extended version, or legwarmers using the sweater sleeves. 1. Start with some sweater sleeves. Remember legs tend to be bigger than arms, so steer clear of sweaters that are already tight on your arms. 2. Cut off the sleeves. Keep them equal in length! Striped sweaters make things super easy because they basically draw the cut lines for you. 3. Turn under the cut edge and sew around the edge to finish off the bottom and prevent unraveling. Happy 2013 and Happy Crafting! Cute! And I love those boots – what brand are they? thanks! The boot brand is Biviel (?) I got them from DSW a couple years ago and haven’t found a pair of boots I like better! This is the first pair of shoes I’ve actually taken to a cobbler to fix the heels. wow, that makes everything sooo much easier! great tutorial, thank you! Steph I love the leg warmers! Mase and I are going to Goodwill tomorrow…which may be a dud since m&d are sweater-obsessed right now, we’ll have to see. My toes are always FREEZING though, I’m going to come up with a way to make “toe warmers” to match the leg warmers.